LED vs LCD TV: what's the difference? There's no such thing as an LED TV. There, we said it. "But what about my new LED TV?" we hear you cry. Well, it's an LCD TV. With some fancy backlighting. Before we delve into how an 'LED TV' differs from a basic LCD TV, it's worth noting how popular the new super-slim technology is becoming. According to market research agency GfK, a total of 8,817,000 LCD TVs were sold in the UK in the 52 weeks ending in July 2010, with LED sets accounting for an additional 355,000. That's a relatively small percentage, though it's also worth knowing that LED-equipped TVs have rocketed in popularity - just 41,000 were sold in the 12 months prior to July 2009. So LED is popular, but what is it? Effectively an LED-backlight is a replacement for the uniform CCFL backlight that gives a LCD TV its brightness. Instead of being always on - and therefore not able to dim in specific areas of the screen - LED lights are arranged either along the sides of the screen ('Edge' LED) or arranged behind the entire screen ('Direct' or 'Full' LED). These LED lights can switch on and off individually, which means the image can have greater contrast - bright whites and deep black in the same image. A good example of how this works is with a dark and dingy movie like Batman Begins. For night scenes a traditional CCFL-backlit LCD TV isn't able to dim sufficiently enough to make the black areas of the image convincing, and neither is it able to show night areas, such as headlights or street lamps. The end result is a picture that isn't dynamic, and dominated by grey where there should be black, and indistinguishable details that ought to be brightly lit. Put simply, the contrast of the panel isn't very good. 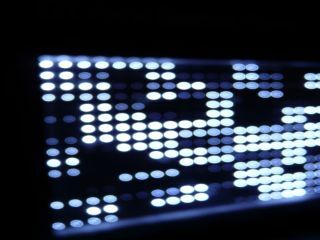 A plasma TV doesn't have this problem - each pixel can light up, or switch-off, according to the demands of the picture. So to counteract its lack of contrast, LED lights are being used instead of CCFL backlights, though how many - and exactly how they're arranged - depends on the brand. 'Edge LED' systems use an array of LED lights along the side that fire light across into the centre of the screen. It's technically the least effective system in terms of achieving a high contrast ratio because it doesn't offer 'local dimming'. As a rule of thumb this system does help produce the slimmest flatscreen TVs around. It's also cheaper to produce. 'Direct' LED systems, which could involve somewhere in the region of 200+ LED lights arranged all over the screen in clusters, is visually the most impressive technology, but it's more expensive - and adds a few extra millimetres to the depth of the TV. Which is better depends on what consumers want. "Edge LED offers various advantages over Direct LED such as a thinner chassis (meaning a larger TV in a smaller position in the home), it is more power efficient (saving the consumer money on utility bills), and picture clarity is improved," a Samsung spokesperson told TechRadar. "Direct LED can create a 'halo effect' meaning that clarity from source content is lost. However, Edge LED suffers less from halo effect as the LEDs themselves are positioned around the edge of the TV, meaning the light source is emitting from the guide plate, producing less blurring of the image." As you might have gathered from that, Samsung is committed to Edge LED tech, citing it as the "superior technology." It's 'halo' argument is valid; clusters of LED lights in the behind the screen can cause bright objects to appear with a slight ring around them. Edge sets do, however, struggle to produce as high a contrast - especially when compared to that other big-screen technology: plasma.